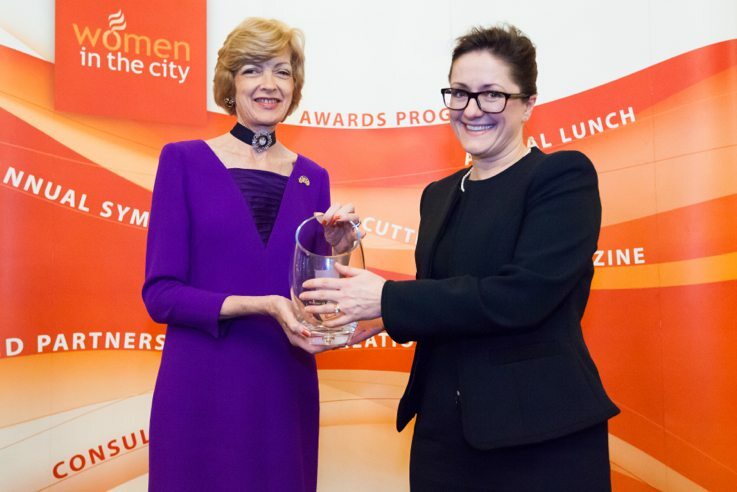 The Rt Hon The Lord Mayor of London presenting the 2013 Winner, Katy Dowding with her prize at the Annual Celebration Lunch. Launched in 2007, the award recognises senior level women who are actively promoting and encouraging the progress of women above and beyond their everyday job. Following nomination and completion of an Application form, a maximum of 5 candidates per Category are selected by the Main Judging Panel to go forward as Category Award Finalists. The Finalists are interviewed by specialist Judging Panels drawn together by each cateogory’s Endorser. Each Endorser selects its Category Winner. The Category Winners are interviewed and one becomes the year’s Woman of Achievement. Nominations open for the Woman of Achievement Award in July.